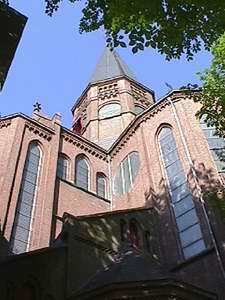 In memory of the former hidden church it replaced, this neo-Gothic building with late Romanesque influences by P.J.H. 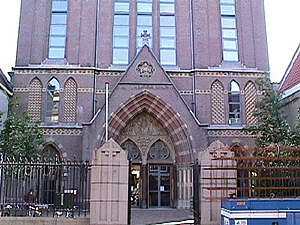 Cuypers is named Posthoornkerk ('Post-horn Church'), although its actual name is Onze Lieve Vrouwe Onbevlekt Ontvangen ('Our Lady Immaculate Conception'). 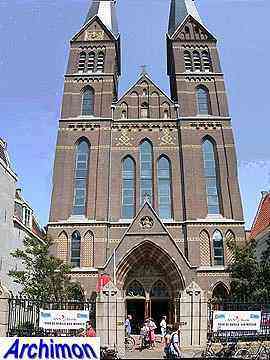 Cuypers at that time still lived in Roermond, and was asked for this church because the priest in charge of the project was impressed by his restoration of the Munsterkerk in that city. The church was built in two stages. First, between 1860 and 1863, the choir, transept and nave were built. 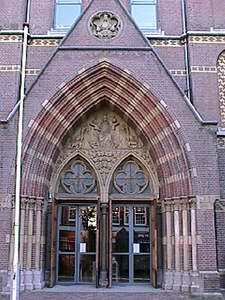 The front was built from 1887 until 1889. Because it is almost completely surrounded by houses, and the parish wanted a real eye-catcher, Cuypers made the church taller than normal. 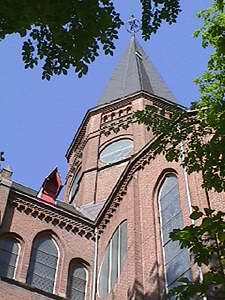 The interior is similar in style to the Munsterkerk in Roermond, but like many hidden churches has two galleries above each other on each side of the nave. Compared to the interior, the exterior is rather plain. Early during the construction Cuypers made a mistake that could only be corrected by the purchase of an extra piece of land. The protestant Hartkamp family granted the necessary piece free of charge; an unusual friendly gesture in a time when protestants and catholics were still in a constant state of cold war. Permission for the second stage of the construction was granted on the condition that the facade would be at a 12,75 metres building-line off the street. By that time Cuypers had abandoned an earlier plan with a single west-tower in favour of a new one with two towers. In 1963 the church was closed for services. Despite the fact that the building in 1972 became a protected monument until 1987 it was threathened by the possibility of demolition. The building is now used for exhibitions, concerts etc.